Peace Cafe provides fresh healthy vegetarian food, a bakery and a fair trade shop. Just 5 minutes from Siem Reap’s Old Market, a hassle free oasis of tranquility with a beautiful spacious garden. We welcome you to come and enjoy fresh and healthy meals in our hassle-tree. (i.e. no bagers-tuk tuk) beautiful garden filled with bird songs. Also check out our fair trade shop for that special gift to friends back home or just for memory sake. We offer vegetarian cooking class in Khmer traditional hut. Community programs available include meditation, yoga, monk chat; we also offer free Khmer class for those who are interested as well as providing English classes to local Cambodians. We provide space in the form of a shop to display various products made by disadvantage / hiv people as well as helping small artisans to advertise their products .The Peace cafe also have monk chat to introduce their way of life and culture to visiting foreigners. 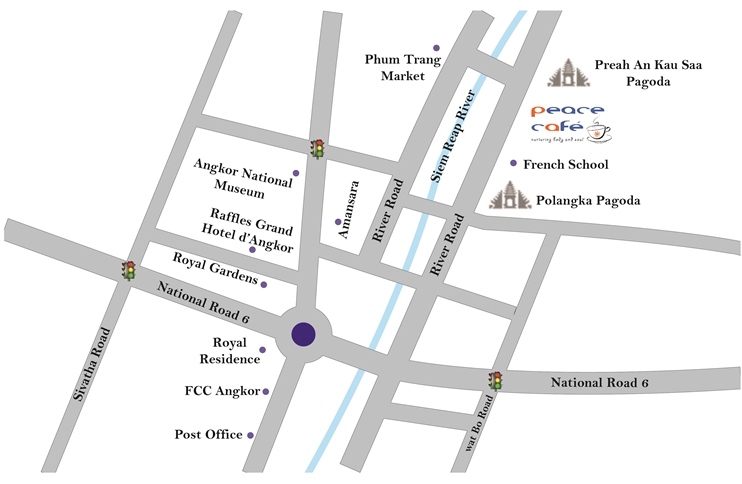 Peace Cafe also hold yoga / Khmer classes and meditation classes to foreigners and is free of charge to the local community. We have an ongoing employment of local poor disadvantaged people that are trained by local NGO eg MARUM (Marum is run by Kaliyanmith, an NGO that has been working with street children and other marginalized young people since 2005 in Siem Reap, Cambodia), THIS LIFE CAMBODIA (This Life Cambodia runs a number of different programs designed to work with communities to help them find their own solution to their developmental needs). We offer vouchers (free food/drinks ) to NGO 'S to help raise funds for their respective organizations. We also work along with TIFO (The Institute For Opportunity) to help the local community eg Building Future Opportunity (BFOK) We support all their teacher salary and scholarship, we made library, teaching material, repaired roof for class room, display center / weaving basket and preparation of rice and provided toilet facilities .